Wow! Summer has flown and it'll be September tomorrow. Whoo-wheee!! 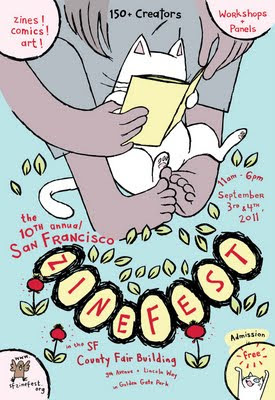 Start out the month on the right foot and take a leisurely stroll to Golden Gate Park this weekend to check out the 10th Annual SF Zine Fest! My pal and super-duper cartoonist, Lark Pien will be there as the comics special guest. So make sure to see her! I'll be helping out at the Sparkplug Comic Books table on Saturday. Annie Murphy, editor of the comics anthology, Gay Genius will be there the entire weekend! So please stop by to visit us and buy loads of books and mini-comics! And also I have the distinguished honor of being on a panel with some of my favorite auto-bio cartoonists on Saturday too. You can see me ramble on and on about football and my funny family stories! If there ever was a reason to do some kind of Kickstarter campaign, or raise money for, my publisher and above all else, my dear FRIEND, Dylan Williams would be it. It saddened me to hear that he's going through some tough times health-wise. Dylan is someone who has been a steady figure in the comics community -- tirelessly exhibiting at shows, big and small, from Comic Con to Sacramento IndyEuphoria, getting the word out about under-represented, off-the-beaten-path comics creators. He's done so much for other people including me. It only make sense to do something for him. So, if you have money to spare, please take time out to buy from the great mix of books Dylan has published primarily as labors of love through the years. He's one of the few fearless indie comics publisher and mini-comics distributors still out there today. He's also one of the nicest, humblest, funniest and most supportive guys in town who can put up with pests like me. incorporating this drawing thing I do to fangirl behavior. Might as well be productive.